Your most complete salad ever! When we’re not teaching or taking an awesome yoga or Pilates class we’re constructing complete nutritious meals in the kitchen and frankly there’s nothing healthier than your perfect salad. 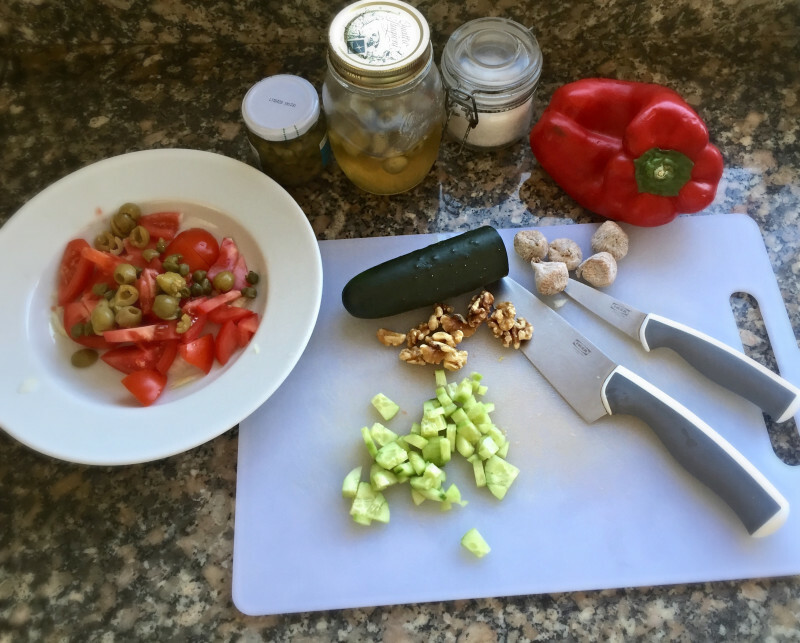 We’ve known for years that the Mediterranean diet is arguably the healthiest diet in the world and the main focus in a typical Med kitchen is fresh foods, fresh produce. One of the tastiest, healthiest and simplest salads is the Xoriatiki Salata or “village salad” (pronounced horiatiki salata”). 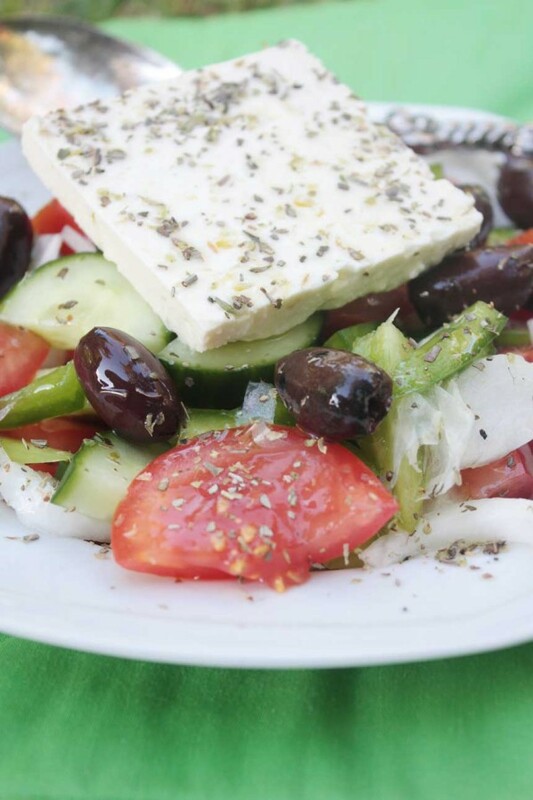 We often refer to this salad as a Greek salad and it can definitely vary from village to village or even country to country but nonetheless a true Greek salad or Xoriatiki Salata has a common basis of ingredients. For a bit of history, the Xoriatiki salad was a favorite of the upper echelon in ancient Greek times and one product that was negatively viewed upon was lettuce. Lettuce was never served to kings or queens, senators or upper class citizens and this tradition of lettuce-less salad still exists today in our Greek Salad. In other words, if you’ve ever ordered a Greek salad anywhere in the world and they gave you lettuce as a base, you didn’t have a Greek salad. 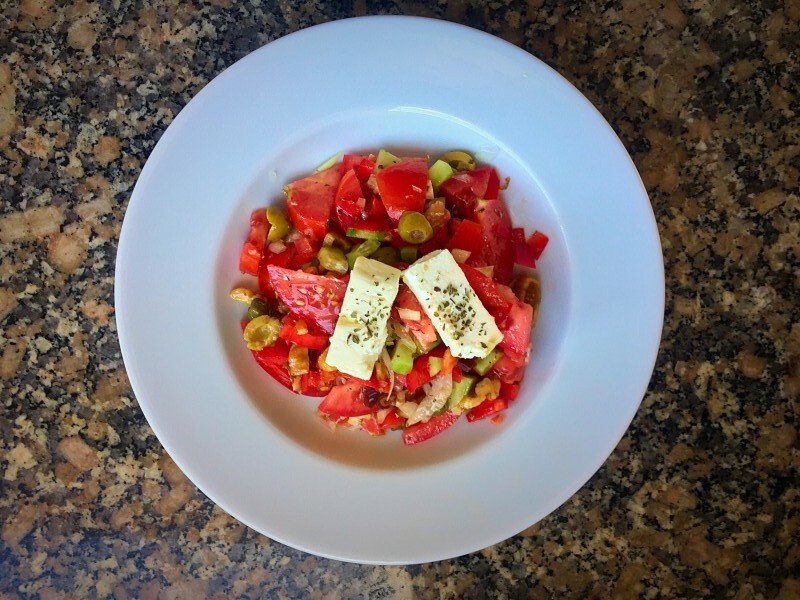 Your simple Xoriatiki Salata consists only of tomatoes, cucumber, red and green bell peppers, onions, kalamata olives, capers, and feta cheese and topped with olive oil, salt and oregano. I know what you’re thinking “mmmm…feta cheese”. Yes! It wouldn’t be a Greek salad without your feta cheese. That perfect blend of goat and lamb milk to make a tangy, almost bitter but super healthy cheese. There’s nothing healthier than feta cheese, low in lactose and fats and high in essential proteins, but I digress. Let’s get back to the salad! In the Sky Salad we’ve amped up your typical Xoriatiki Salata with more amazing vitamins, minerals and fibre that are excellent for the digestive system. We’ve kept the same base of ingredients and added more mediterranean dried fruits for a bit more flavour and balance. Here’s the essential basis of the Xoriatiki Salata. You decide the quantity of each one of the ingredients. The more veggies the better we say! Now for the Sky additions! We’ve kept it still very mediterranean and seeing as the better half of Sky Pilates and Yoga is Greek, she had the final vote! These additions give the salad a little sweetness, more fibre and an excellent source of cancer fighting nutrients and antioxidants. Check out these two articles on Dates and Figs for more info on their exceptional potency. 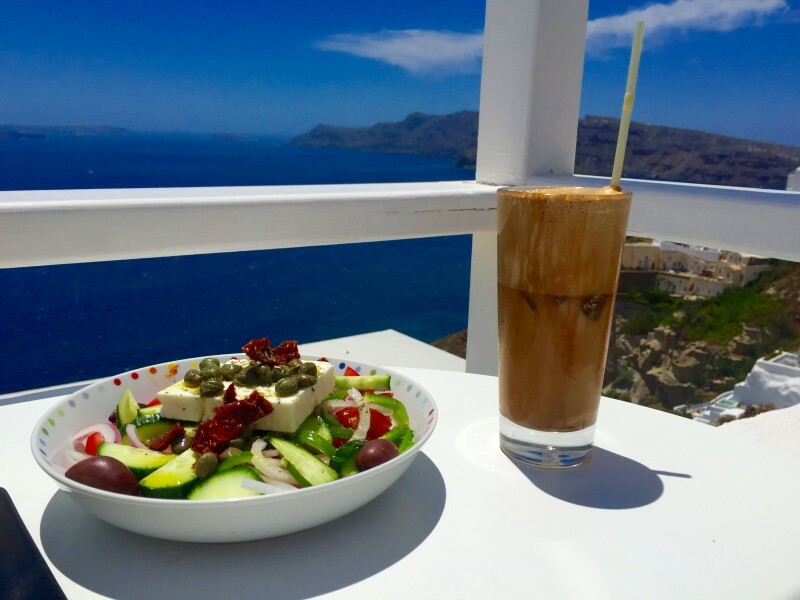 Now sit back and enjoy your Sky Greek Salad with an iced cappuccino with almond milk. 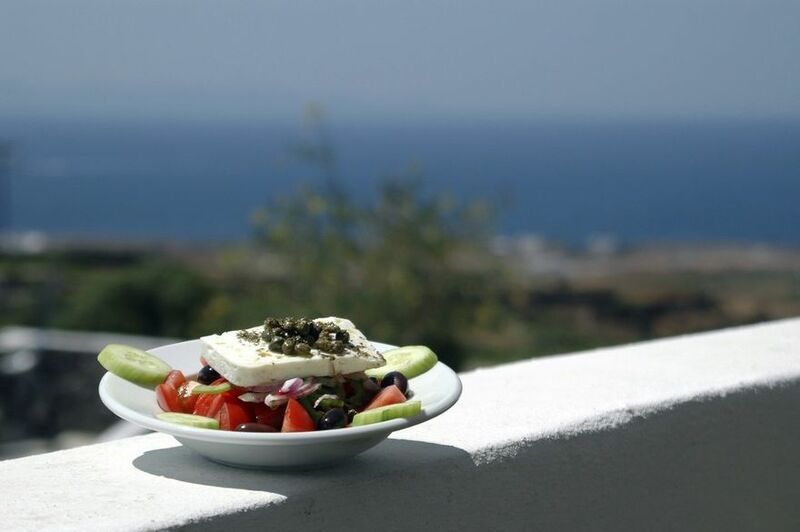 Mmm….our favourite whilst in Santorini.